Our two week holiday has started and since I don’t want you all to miss out on a single thing, here it comes. After two hours of flying we safely arrived at Phuket Airport. Here we had a drink while looking for hotel on the internet. This proved to be a very difficult and tedious task but we were finally able to make a reservation for a hotel in Patong. If you like crowdy and ugly beaches, many tourists who have no (self)respect, one night stands and massages with ‘something extra’; Patong is the place to be. We on the other hand wanted to get out of this Hellhole as fast as possible. We stayed the night in a nice hotel room but when morning came we bolted. We booked a boat to Koh Phi Phi, an island not far from Phuket. When the island made itself visible for us, we were in awe. We knew it was considered a very beautiful place on earth but we never even dreamed of this view. 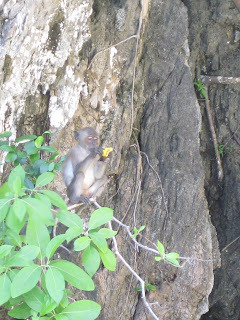 Lush green mountains with a crystal clear sea, lagoons and beaches with palm trees and last but not least: wild monkeys! 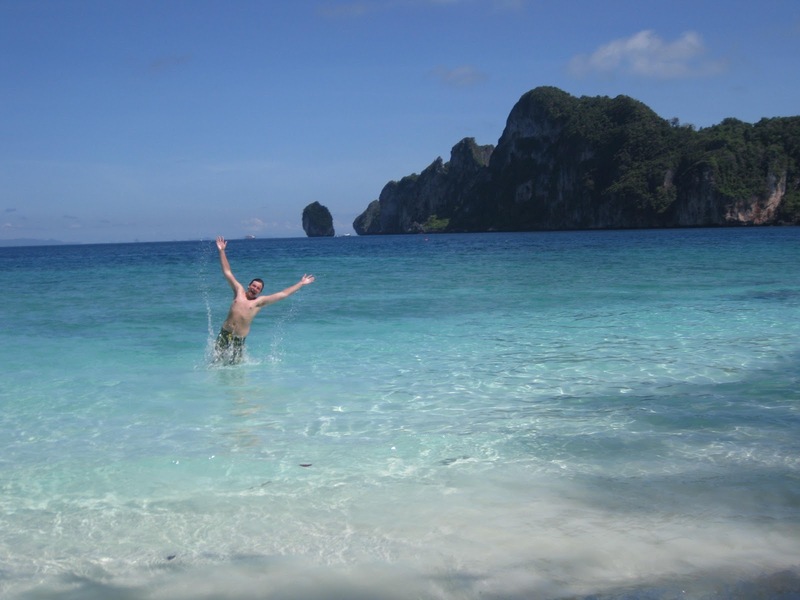 On our first day we decided to explore the island and ended up swimming, eating and having a cocktail in a cozy beach bar. When morning came we were feeling quite energetic and went for a 5 hour kayak trip. The thing is: that’s just way too long. With the blistering sun on your bare skin it’s hard to manage physical labor. We first disembarked on Monkey Beach. 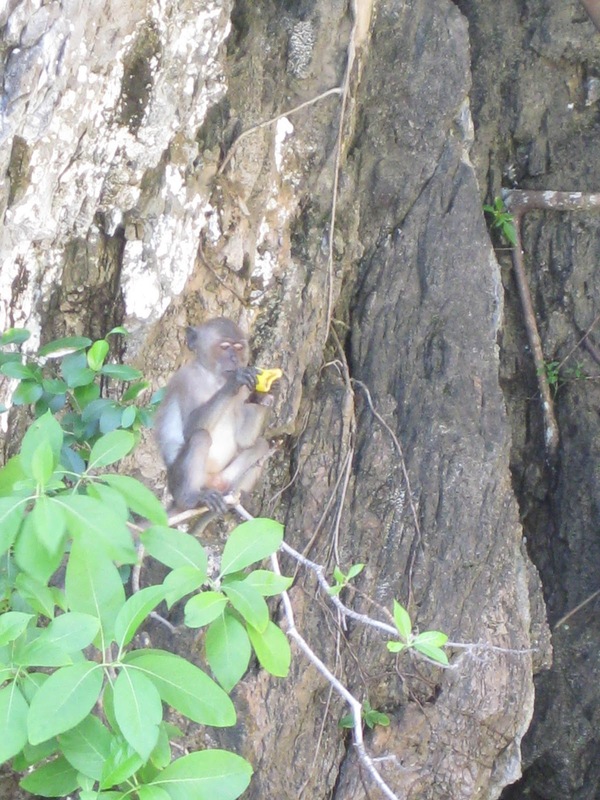 That’s right, a beach where wild monkeys live! After a tiresome trip we managed to return to our beach, but not without harm. The three of us looked like lobsters (Could it be that we forgot to put on suntan lotion?) and were in quite a lot of pain due to our burned skins. I even got something extra to take care of. 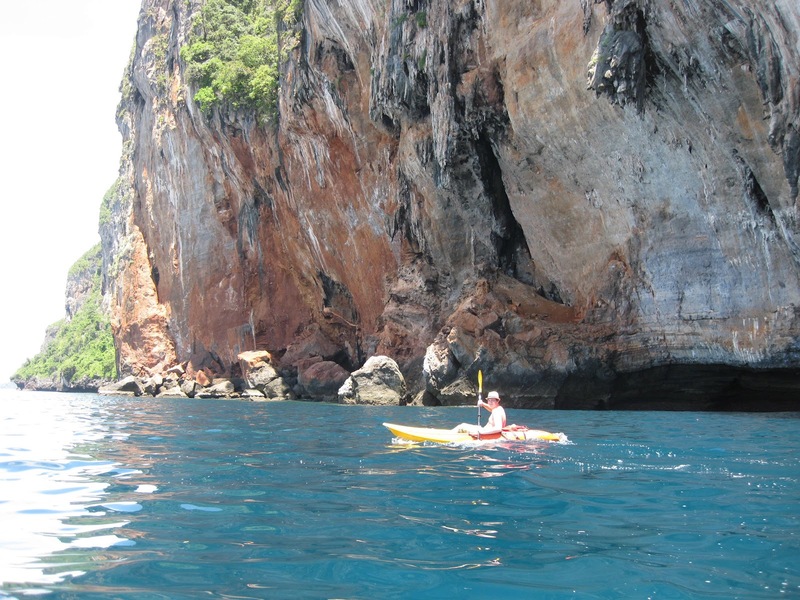 While I was kayaking in a small grove, I thought I would be able to climb a couple of rocks and then jump back in my kayak. Result: three stitches in my right hand + a two day swimming prohibition issued by the local doctor. The next day we decided to take it a bit easier because of our (and especially my) “wounds”. 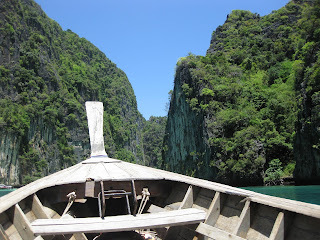 We rented a long tail boat and a groovy Rasta captain took us too many beautiful places around the island. 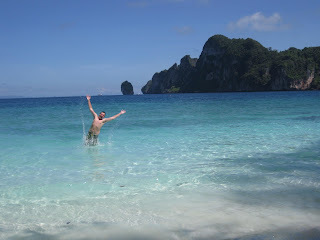 We went snorkeling, fed fishes, visited Maya Beach (known form the movie: The Beach) and visited Viking Cave. This is a cave where a couple of gypsy Thai actually live. For dinner we had a very nice Mexican platter in a rooftop bar overlooking the two beautiful bays of the island.